The current exhibition at the Marjorie Barrick Museum, Five features paintings, sculptures, videos, installations, and photographs from contemporary artists based in LA and New York. Materiality, attitude, and wit tie their work together, as well as their past participation in the ongoing UNLV Artist-in-Residence Program. I recently asked Alisha Kerlin and D.K. Sole if they would like to join me for a walk through the exhibition to talk about the show and create a list of questions for the five artists. Alisha Kerlin, Spring 2012 UNLV Artist-in-Residence, relocated to Las Vegas from New York and is currently serving as the Interim Director at the Museum. D.K. Sole joined the Barrick team in 2012. She leads educational tours and produces written material for the Museum. Many thanks to the artists, Kerlin and Sole for agreeing to participate in this current S + N series “5 for FIVE” and for sharing their unique insights into the work and its reception by the public. This third post shares our interview with artist Erin Cosgrove. 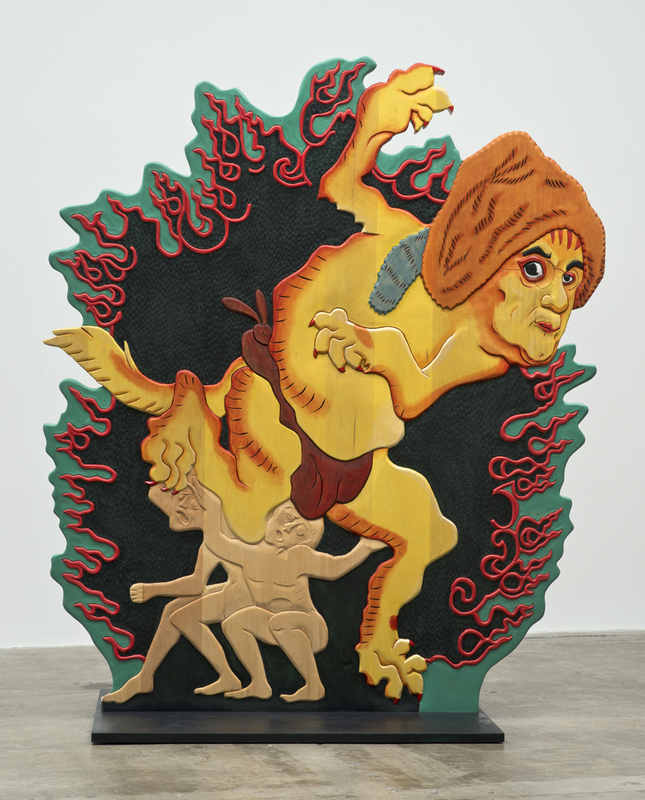 At the opening of Five, Erin Cosgrove joked that she was “not subtle,” and the satirical intent of her Urfathers — large, painted woodcarvings of historical figures reimagined as monstrous semi-humans — seems obvious. Describing that intent, however, can be unexpectedly difficult. Based in Los Angeles, she often articulates her critiques of contemporary life by refracting them through pop culture depictions of the past, not only in the case of the wooden sculptures but also in a pair of films that the Barrick is screening every Saturday afternoon for the duration of the exhibition, The March of History and In Defense of Ghosts (both 2012). We asked her if she wouldn't mind answering a few questions. A visitor came into the Barrick office one day after viewing the Urfathers and asked the staff what the artist “was trying to say about Lincoln.” His tone suggested that he thought you might be hostile to the president, but he couldn’t figure out where the hostility was coming from or how it was trying to express itself. Have galleries or other institutions ever told you that they were worried about the controversy that the Urfathers might cause? EC: I understand how this happens. 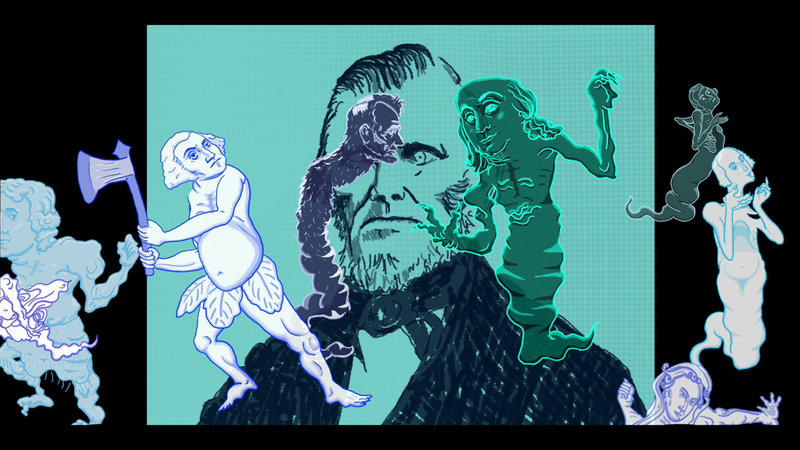 Lincoln’s face and a pair of monstrous legs are mashed up in the piece, so a viewer might have a gut response that I am equating Lincoln with a monster. But it’s kind of like watching the first 7 minutes of Saving Private Ryan and deciding the movie is anti-American because a lot of Americans die horribly. In Urfather Lincoln you can see that two monsters are wearing a giant Lincoln mask or bobble head. Even without resorting to allegory it becomes clear that this is not — Washington, Lincoln, Adams, whoever — but instead something far more nefarious posing as one of our archetypal leaders. Who are these monsters trying to pass themselves off as Founding Fathers and Lincoln? The first time I showed this work in 2012 was when we were in the midst of the Tea Party epidemic. I thought it the height of hypocrisy for the Tea Party to use the Founding Fathers, men of the Enlightenment, as the basis for the Tea Party’s knuckle-dragging, jingoistic world view — one that is both foreign and vulgar to contemporary Washingtons, Lincolns, Adams, Franklins, and Jeffersons. And now, four years later, we are dealing with a tangerine monster that may be far more dangerous. Satire will always be misunderstood by the impatient and by those who only draw meaning from their gut reactions. And satire has a message and a victim, so it necessarily will rankle some people. Then again, some people need to be rankled. We are great readers of music, books, movies and other art forms, but visual arts have now become strange to some. More arts education would help remind people that art is stuff that means other stuff. The very nature of communication is that something always means something else (a word by itself, without understanding, is a sound, a shape, not meaning). But just because something means something else that doesn’t mean something can mean anything. We need to do a better job emboldening people to rediscover meaning in art, and thereby be reminded that our entire interface with the world hangs on metaphor. Had you used woodcarving in your practice before you made the Urfathers? What drew you to it? How is wood different from the other media you’ve used? Would you make woodcarvings again in the future? EC: This was the first time I used woodcarving. I wanted to work with a medium that evoked both old polychrome deities and saints, and colonial America. When I hit on woodcarving it seemed the perfect vehicle. Carving wood is truly a wonderful thing to do. These days I sit in front of a computer, day after day, animating, a grueling way to work. There’s something deeply satisfying about working in physical space, the haptic aspect of creating where a material moves beneath your hands. I can’t wait to get back to the studio and carve some more. Could you talk to us about the relationship between your two short films? How does video fit into your practice? EC: My previous art had been about dogma, specifically religious dogma in the wake of 9/11. But over the last few years I’ve been thinking about power structures and how many in the US seem to vote against their economic interests. There are a lot of reasons that poor and middle class people vote Republican despite that Republicans legislate against their interests. Whatever the reason, some masterful manipulation is employed to turn people against themselves. Sometimes the sock puppet of patriotism is the manipulation that’s employed. I was also researching a lot of random historical things, like Pope Innocent III’s On the Misery of the Human Condition (1190 - 1198) and Pico De Mirandola’s Oration on the Dignity of Man (1486) (your typical body-hating ascetic religious rant verses a positive secular humanistic essay), and the writings of Mozi who pre-dates Jesus by almost half a millennium, but spoke of the “Golden Rule” or universal love. And I was also thinking quite a bit about the quote: "Men will never be free until the last king is strangled with the entrails of the last priest.” A quote often attributed to Diderot or Voltaire, but likely the work of atheist-priest Jean Meslier. I wanted to create a work that critically engaged anti-humanist sentiments, addressing two of the flavors it comes in: Church and State. And the so-called Tea Party movement embodied a negative version of both; in fact they made a pseudo-religion of sorts of our Founding Fathers, as they willfully misinterpreted their Enlightenment ideals. The video, The March of History (2012) at heart deals with economic oppression and takes inspiration from of Walter Benjamin’s On the Concept of History, in which he says, “Whoever until this day emerges victorious, marches in the triumphal procession in which today’s rulers tread over those who are sprawled underfoot.” The other video, In Defense of Ghosts, is based on Mozi’s On the Concept of Ghosts, in which Mozi lays out the logical reasons to believe in ghosts or ancestor worship. This reminded me quite a bit of the Tea Party’s worship of their twisted Founding Father phantasms. Could you tell us how (and if) the research for your films shaped the sculpture series, or vice versa? EC: The sculptures come from the videos. 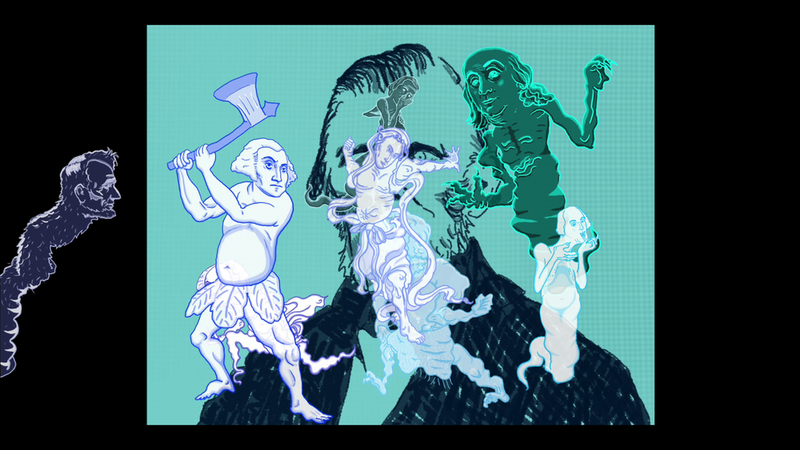 The images are from the In Defense of Ghosts video, where the orator is projecting images of the Founding Fathers as ghost-demons we should believe in. They also come from the oppression made visible in The March of History. But the sculptures would be boring if they were just footnotes for the films - so they became their own allegorical creatures. The staff has noticed that children respond enthusiastically to the color palette in your work. (Children also tend to be interested in the figures as characters, even if they don’t realize who they are supposed to be.) Were any of your colors symbolic, or were they chosen for other reasons such as clarity and attractiveness? Is there a relationship between the unmistakable brightness of your colors and the conspicuous grotesquerie of your satirical critique? EC: I tend to do two kinds of work - somewhat crazy, content-filled allegorical screeds with so many references you get tired keeping track, and colorful, playful works. The two come together with my narrative animations, but with both allegory and satire are present. Kids tend to love my colorful, playful works. I think part of the reason is that they are fun, enticing, but there is also a hint of the grotesque and terror that children’s video and books tend to leave out. Kids know there’s more to the world than what Disney shows them. Ask any child about their dreams and you will see how crazy and violent and protosexual a child’s mind is. They also intrinsically understand what some adults don’t — that these are characters, and that we are playing, and that play is serious. I want to activate that part of everyone’s brain — the mythical, hopeful, and fantastical center of the brain (I think it’s behind the prefrontal cortex somewhere). And color is a way of signaling that. I don’t have a stable color palette, which is fine, as color is relational anyway. But I draw inspiration from other cultures to move me from my unconscious color palette. For example, purple is a color I think that I don’t like, but in the royal paintings of Jodhpur, for example, purple is used so beautifully with golden oranges and lime greens that it becomes a new, brilliant color. I was looking at Indian, Tibetan, and Nepalese art a lot while I was making the Urfathers (because that’s the art that was making my brain melt at that time), but I was also making relational color decisions in the moment. I’m pretty sure if I left the Urfathers unpainted they would go with people’s living room decor better, but I feel that if that’s what you have in your mind while you are making art, you have already given up too much ground. Also we have falsely come to equate a more restrained palette with being more refined. Like classical sculptures. But most ancient sculptures, including classical, were brightly-colored to echo and celebrate life. So I guess I’m more of an ancientist than a modernist when it comes to color. Erin Cosgrove is an artist and writer who uses video, animation, books, painting, scrolls, timelines, installation, and performance in her artwork. Her videos and Urfather sculptures merge satire, philosophy, mythology, and history. She is currently making a feature-length animation (The Living Book) of a post-apocalyptic couple searching for a new home in the cosmos when the ship’s cultural files become corrupted. Cosgrove is one of three LA artists selected by Freewaves and funded by The Confucious Institute to go to China’s Dunhuang Caves in the Gobi Desert and in response make an artwork to premiere as part of the Chinese Onscreen Biennial. Cosgrove lives and works in Los Angeles, CA. UNLV Artist-in-Residence Spring 2013. Five is on view at the Marjorie Barrick Museum on the campus of UNLV through September 10. For more information click here. For more information about the Five video screenings scheduled on Saturdays through the run of the exhibition, including Erin Cosgrove's In Defense of Ghosts, click here. Read the Deborah Aschheim and Ash Ferlito interviews here. The Barrick Museum offers tours of Five by appointment. A checklist of the exhibition can be found here.